August 8, 2007: Will they come, or will they not? That is the question. 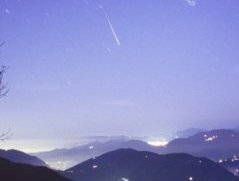 Right: An early morning meteor over Italy in Nov. 2006. This is what an Aurigid might look like. Photo credit: Antonio Finazzi. The source of the putative shower is Comet Kiess (C/1911 N1), a mysterious "long-period comet" that has visited the inner solar system only twice in the past two thousand years. In 83 BC, give or take a few centuries, Comet Kiess swung by the sun and laid down a trail of dusty debris that has been drifting toward Earth's orbit ever since. On Sept. 1, 2007, the dusty trail and Earth will meet. But will a shower actually materialize? The answer lies in the unknown contents of the debris stream. "We have so little experience with ancient debris from long-period comets," notes Bill Cooke of NASA's Meteoroid Environment Office (MEO) at the Marshall Space Flight Center. "Almost anything could happen—from a fizzle to a beautiful meteor shower." Astronomers were first alerted seven years ago to the possibility of a shower by Finnish astronomer Esko Lyytinen and Peter Jenniskens of the SETI Institute in Mountain View, CA—both are accomplished meteor forecasters who study the dynamics of cometary dust trails. Jenniskens has since teamed with Jeremie Vaubaillon of Caltech to refine the forecast using a debris stream model developed by Vaubaillon. 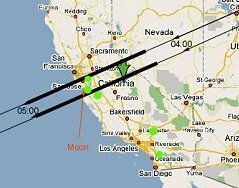 "We expect the outburst to peak at 11:36 UT (4:36 a.m. PDT) +/- 20 minutes on Sept. 1st," says Jenniskens. 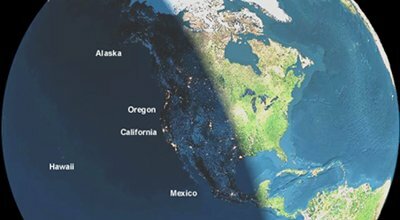 "The whole event should last about 2 hours and be visible from California, Oregon, Hawaii and the eastern Pacific Ocean." An independent model of the debris stream calculated by Danielle Moser, a colleague of Cooke at the MEO, predicts a peak time of 11:26 UT. "That's in good agreement with Jenniskens and Vaubaillon," says Cooke. "However, our model predicts a mostly empty stream and a very weak shower." "Personally, I think the meteor rate will reach 100 per hour at best," notes Vaubaillon, "but some colleagues are more optimistic, so, suspense, suspense!!!" Earth has had at least three encounters with the debris stream in the past century—in 1935, 1986, and 1994. Unfortunately, few people were outdoors paying attention. 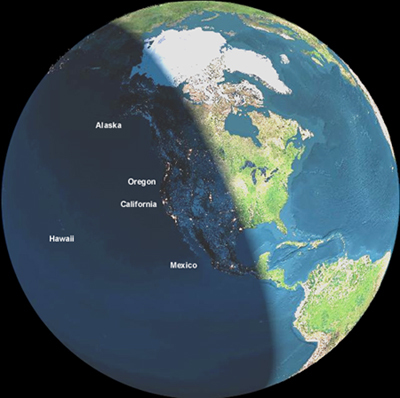 The best observed encounter was in 1994 when veteran meteor watchers Bob Lunsford and George Zay of southern California witnessed a number of bright blue-green meteors emerging from Auriga. The brief shower was remarkable both for its conspicuous lack of faint meteors and for the vivid colors--characteristics that may be repeated on Sept. 1st. #1 -- Long period comets almost always take us by surprise. They linger in the outer solar system, hiding in the dark for thousands or millions of years, until their slow orbits turn them sunward and--in they plunge! Because of this surprise factor, long period comets pose a unique impact threat. Jenniskens and others are keen to study meteor showers from long period comets because the showers could be a "tell" that a comet is out there, and the orbit of the meteoroids can reveal where. #2 -- Meteors from long period comets may be very primitive. Consider the following: Most meteor showers (e.g., the Perseids and Leonids) are caused by short period comets, which pass through the inner solar system every few decades or, at most, centuries. Their icy surfaces are frequently heated and vaporized by intense sunlight, and the comet dust they produce is correspondingly fresh. Long period comets, on the other hand, are rarely sun-blasted, and their surfaces may retain ancient substances formed by billions of years of cosmic ray exposure in the outer solar system. Flakes from this "pristine crust" may produce odd colors when they hit Earth's atmosphere. Is that why the Aurigid meteors of 1994 were blue-green? Were they bits of pristine crust from Comet Kiess? Again, no one knows. Jenniskens notes that another meteor outburst, the alpha Monocerotids of 1995, also thought to hail from an unknown long-period comet, was strange: "The alpha-Monocerotids penetrated 5 km deeper in the atmosphere than other meteors of similar size and speed and they had [an unusually] low content of sodium." To get to the bottom of some of these mysteries, Jenniskens and colleagues from the NASA Ames Research Center, Utah State University, the USAF Academy and elsewhere will board two private jets to observe the Aurigids from the clear air of 45,000 feet. They'll use spectrometers, cameras and telescopes to measure the velocity, penetration, and chemical composition of incoming meteoroids. Bill Cooke of the MEO won't be on board, but he wishes the flyers well. "If this shower actually happens, they data they collect may tell us new things about an important population of meteoroids in the solar system. Plus, it would be a good show for people on the ground." Sept. 1, 2007: The answers await. Aurigid Meteor Shower web sites: from NASA Ames, from the SETI Institute, from Jeremie Vaubaillon of Caltech.